The city of Aurora, Colorado, is paying a $325,000 settlement to over two dozen citizens detained and searched at gunpoint in a 2012 incident. Police had tracked a bank robber via a GPS transmitter hidden in the stolen money but were unable to identify the robber's precise location. Rather than use a handheld beacon that could more accurately find the transmitter, they surrounded 19 vehicles stopped at a red light and forced the 28 citizens out at gunpoint. The police then proceeded to pat them down, handcuff them, and force them to sit on the ground while their vehicles were searched. 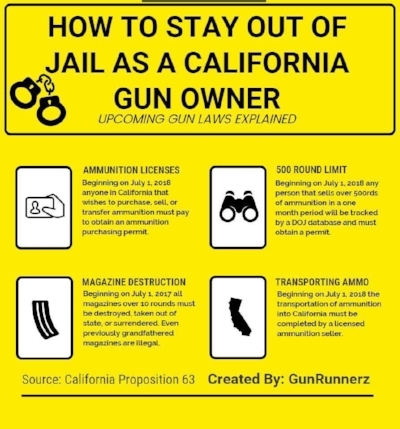 This meme, posted on Facebook, summarizes the latest gun control regulations implemented by the state of California. Magazines holding more than ten rounds, formerly grandfathered, are now entirely banned and must be surrendered, destroyed, or removed from the state. Permits will now be required to purchase, sell, transfer, or transport ammunition. As of 2018, selling more than 500 rounds of ammunition (e.g. 5 boxes of .22 long rifle) in one month will result in entry into a tracking database. This is what "reasonable and common sense safety restrictions" lead to every time, regardless of assurances, and is precisely why we oppose them so vehemently. The State of Missouri has become the 11th to adopt "Constitutional carry," no longer requiring citizens to request government permission to carry a concealed handgun. 22% of the nation now recognizes this right, and the movement appears to be gaining traction. In Washington, D.C., House Republicans used their first session to attempt to gut the independent Office of Congressional Ethics. When made public, the move was met with vocal citizen opposition - including President-elect Donald Trump - and was swiftly abandoned. In a party-line vote, House Republicans imposed fines for any member of Congress to live-stream audio or video - or to post still photos - from the House floor. First offenses will result in a $500 fine, with subsequent violations costing the offender $2,500. Heinlein comes to mind: "Secrecy is the keystone to all tyranny. Not force, but secrecy and censorship. When any government or church for that matter, undertakes to say to its subjects, 'This you may not read, this you must not know,' the end result is tyranny and oppression, no matter how holy the motives. " Civil asset forfeiture has been dealt another blow, as the state of Ohio passes a law requiring criminal conviction before private property can be seized. This law does not outright abolish the practice, but sets a threshold of $15,000 for forfeiture with prior conviction. Ohio is now the 12th state with such legal limitations on government seizure of private property.